Mobile adoption may be driving a surge in Twitter use, according to a major research firm. This finding and other data related to how or why users tweet may indicate that Twitter could be an even more important channel for marketers in the mobile era. The Pew Internet & American Life Project has been tracking Twitter use since November 2010 and has included a set of Twitter-specific questions on four surveys since then. When data from these surveys is compared, the microblogging platform’s mobile difference begins to become visible. In November 2010, Pew found that some 8 percent of online adults used Twitter and that some 2 percent used Twitter daily. By May 2011, 13 percent online adults were using Twitter, but only 4 percent were using the service on a typical day. In August 2011, 12 percent of online adults used Twitter, and 5 percent tweeted or read tweets on a typical day. In Pew’s most recent survey, which was conducted in February 2012, 15 percent of online adults used Twitter and a full 8 percent accessed the service on a typical day. Pew has tracked Twitter usage over time. The Pew data shows that while overall Twitter usage had not grown remarkably from May 2011 to February 2012 — 13 percent of online adults compared to 15 percent — the percentage of Internet users that interact with Twitter on a typical day had doubled, indicating a significant increase in engagement, if not in adoption. This increase in engagement, according to Pew, is likely because of mobile phones. Pew noted that both the largest growth in Twitter usage and the greatest growth in smartphone ownership came from the 18-to-24-year-old demographic. “As with general Twitter usage, smartphone owners are much more likely than average to use Twitter on their phones (overall 16 percent of smartphone owners use Twitter on their phones and 10 percent do so on a typical day),” the Pew report’s authors wrote. 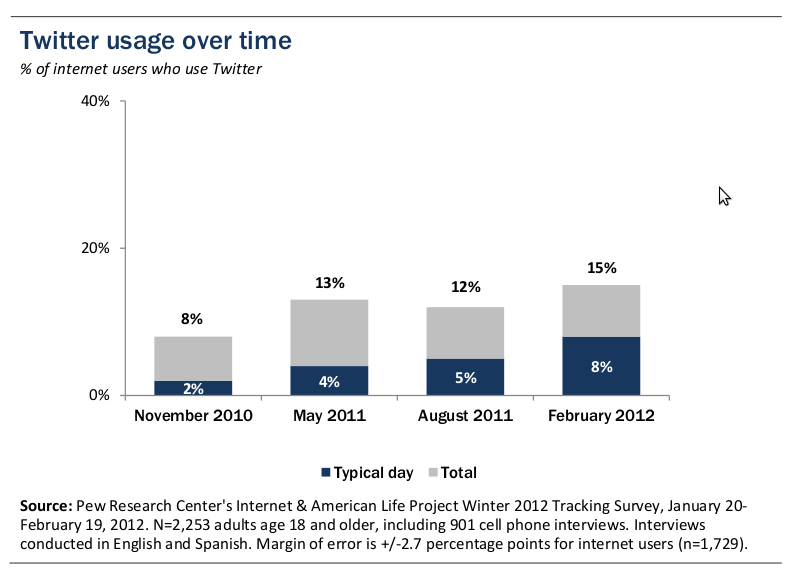 One in five adult Internet users aged 18-to-24 interacted with Twitter on a typical day. About 11 percent of the most Twitter-using demographic, those aged 25-to-34, used the platform daily. Twitter users follow celebrities, brands, and even news. An August 2011 report from Lab24, a technology-consulting firm, found that some 15 percent of Twitter users joined the service to follow a specific celebrity or commercial brand. What’s more, that survey found that about 90 percent of Twitter users followed at least one commercial brand, with 31 percent of Twitter users following one-to-five brands and 20 percent following six-to-ten brands. Perhaps 90 percent of Twitter users follow a commercial brand. The fact that so many Twitter users follow brands may represent an opportunity for marketers. 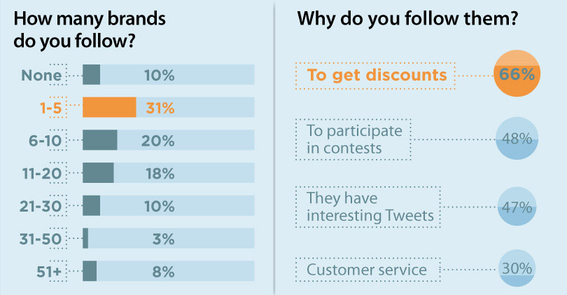 The same Lab24 survey found that 66 percent of those Twitter users that follow commercial brands do so to get discounts. Another 48 percent follow brands to enter and participate in contests. When considered with the Pew data about Twitter user engagement and mobility, there may be an argument that Twitter could be a good channel for engaging mobile users with either flash sales or with contests. Separately, it is also interesting that Twitter may be contributing to how users get news. As a specific example, Twitter users tended to publish earlier and, perhaps, more accurate reports about the Arab Spring than did established media sites and publishers. A University of Chicago study looked at just how important Twitter, and mobile phones, became during the uprisings. Similarly, Twitter has famously released news related to sports or celebrities before reports appeared in mainstream media. A sad example of Twitter’s reporting prowess may be the untimely death of singer Whitney Houston, which was accurately reported on Twitter 27 minutes before the Associated Press broke the news, according to Mashable. Overall, Twitter and other social media sites may account for about 9 percent of news consumption, according to a separate Pew study from 2011. This too may be useful for marketers who could employ the service not just to engage potential customers, but also to monitor trends.